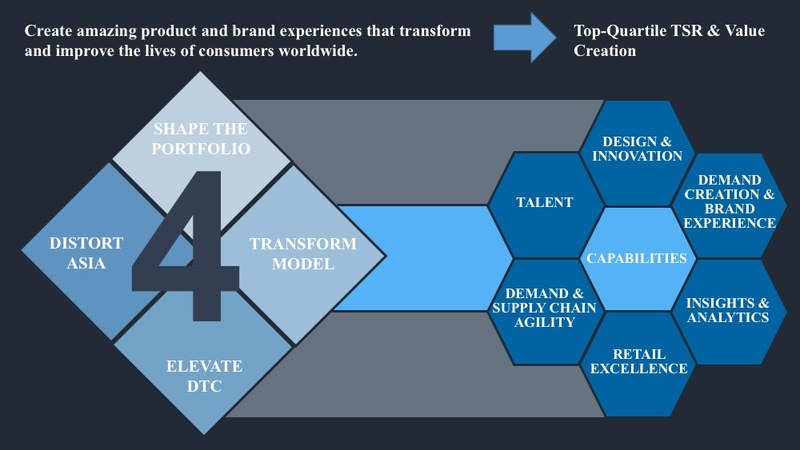 The 2021 strategic growth plan fuels our aspiration to consistently grow by creating amazing products and brand experiences that transform and improve the lives of consumers worldwide. The 2021 strategic growth plan addresses the quickly changing market landscape with a measurable goal of delivering top quartile total shareholder returns. All forward-looking numbers and growth rates below exclude VF’s Licensed Sports Group given the company’s publicly announced decision to sell LSG to Fanatics on April 4, 2017. Revenue through 2021 is expected to grow at a five-year compounded annual growth rate (CAGR) between 4 percent and 6 percent, fueled by VF’s largest brands (the Vans®, The North Face® and Timberland® brands) and the company’s International and Direct-to-Consumer business platforms. Gross margin is expected to reach 51.5 percent in 2021. Operating margin is expected to reach 16.0 percent in 2021. Earnings per share is expected to grow at a five-year CAGR of between 10 percent and 12 percent. The company expects to generate more than $9 billion of cash from operations on a cumulative basis between 2017 and 2021 and return $8 billion to shareholders through dividends and share repurchases. VF expects to deliver annual total shareholder return (TSR) in the 13 percent to 15 percent range as the company continues to target top quartile TSR performance.